Hello! It's time for another CR84FN (Create For Fun) Challenge! Thank you to all who joined us last week.. it was fun viewing all of your fabulous creations! 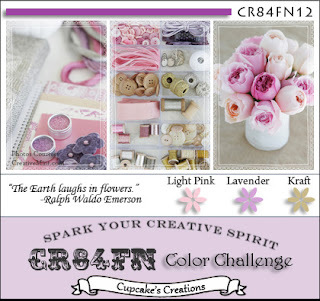 For this week's challenge (CR84FN12), Mona has chosen the lovely color palette of Light Pink, Lavender and Kraft. The photos in the graphic above are courtesy of Leslie at A Creative Mint. I paired some Memory Box Gossamer paper with some stamped patterned paper that I made using Waltzingmouse's Text-It (it is the rectangular panel where the heart is popped up and unfortunately covering most of it :)). I embossed the heart from Seasons of Love - Tags onto some Rustic Cream cardstock, cut it out with Spellbinders Classic Heart Nestabilities and stamped "Love You" in the center. Accessories: Classic Heart and Classic Scalloped Heart Nestabilities (Spellbinders), Loops border punch (Martha Stewart), Pearl (Prima), Desert Sand embossing powder (CTMH), Dyed seam binding ribbon, Glimmer Mist (Tattered Angels), Pearl trim, Button, Foam tape, Thread, Sewing machine. Ohhh, I love this, amazing inspiration! Beautiful card Stephanie! Love the WM lacy heart and gorgeous bow! Beautiful! Wonderful texture from the embossing! The added stitching and design are lovely! Wonderful heart and backing papers, I recognise the WMS!! Such pretty detail with the stitching and big, beautiful bow!! Fab. Gorgeous Design and love those papers (some of my favorites). Beautiful heart and card! Your card is so elegant and beautiful Stephanie...love it muchly! GORGEOUS GORGEOUS card Stephanie! LOVE that heart with the stitching! LOVE the three panels of background! LOVE that lacey edge punch! Just FAB! Beautiful, Stephanie - what a masterpiece! This is gorgeous! 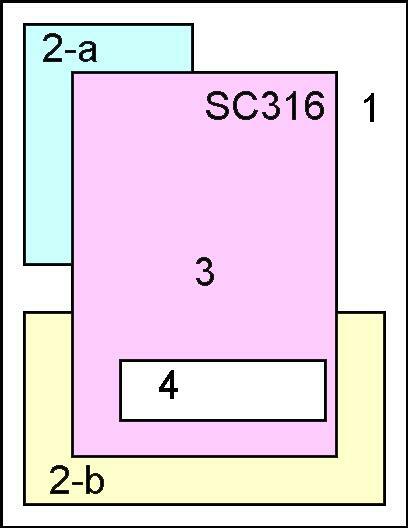 Love the WMS heart with these colours, just dreamy! 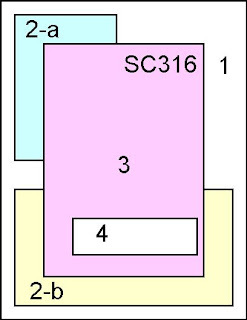 Ohhh this is so pretty. I'm doing the happy dance. Your bow is beautiful. This is stunnig!! Love your color combos!! Oh Stephanie! This is absolutely divine!!! ABSOLUTE GORGEOUSNESS....seriously WOW! So pretty and feminine!!! What a great mix of patterns! This is beautiful. I love your choice of pattern papers and that bow is scrumptious! All that stitching around the heart is fantastic, too! Oh my goodness - beautiful! The seam binding and sweet button, the pink heart and stitching, the papers ... sigh. I love this! What can I say? This is an absolutely stunning card! I love everything about it!! 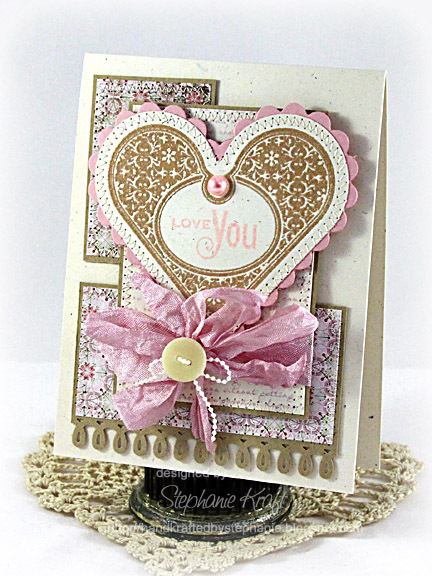 Stunning card from the layout to the embossing to the pretty fragile pink ribbon.